Well rested we come down for breakfast which is included in the price of our room. The food is coming and coming. Variety of bread and toppings – cheese, jam, Nutella, butter – tray loaded with fruit, hot item – our choice is from eggs, wiener sausage and smoked sausage, and the hot item also comes with a large plate of beans. One nearly needs siesta after finishing. The energy is needed. Today’s stage is not only suppose to be most scenic, but also most difficult with a climb of 3 mountains along the way. It’s around 10:00 when we start hiking. Forecast promised a sunny day but the layer of clouds above our heads tell a different story. 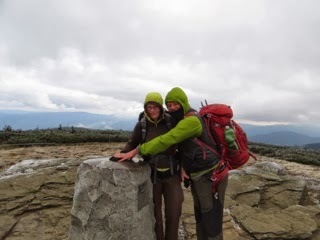 It’s cold, and somewhat windy, and even though we are heading uphill (very gently), we put another layer on. 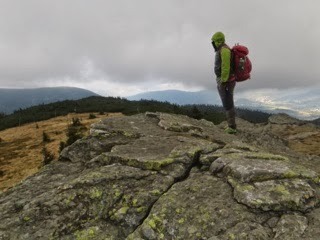 After a short side trip to Sněhová Kotlina (Snow Basin), place where frequent avalanche activity can be seen, and a short off trail scramble we reconnect with our route; however alternate trail comes shortly, one that leads to the top of Červená Hora (Red Mountain). 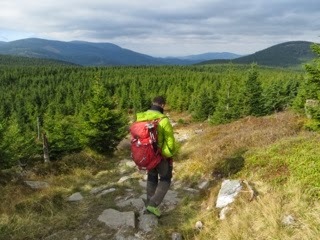 This trail takes from gravel road to a dirt path, heading uphill among forest of kosodřevina. It’s a pleasant climb, not really steep with more and more views bellow us. Today they are obscured by clouds, and only occasionally we see a village or two, but the views we lack bellow are more than generously replaced by beautiful scenes here in the heights. Clouds rise around us, occasionally letting sun rays through. These sun breaks don’t last more than 15 – 20 seconds but during the short time foliage of ever present blueberry bushes turn crimson red, and straws of grass bath in golden glow. 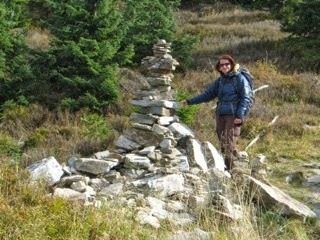 Summit of Červená Hora consist of a small rock formation. While the view down into the valley is still cloudy, we can see a decent distance to the opposite direction where hills stretch and yellow foliage of leafy trees remind us summer is definitely over. 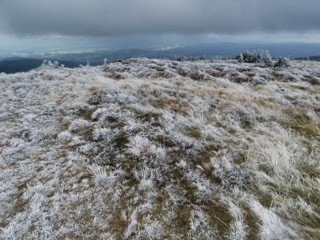 The temperature is just slightly above freezing, and once we start climbing towards the second mountain of the day Keprník, frost decorates the shrubs and grasses, beautiful white touch added to the mix of fall colors. At 13:15 we reach the summit, rim ice grows from the sign post, and as far as we can see grasses are wintry white. Same scenery awaits us atop Šerák, our last summit and westernmost mountain in Hrubý Jeseník. Gladly we slip inside the cottage at the summit to warm up with a cup of tea. Chata Jiřího na Šeráku was built in 1888, burned down in 1893, and was reconstructed the same year. Today the rooms look much different, cozy and warm with modern showers and comfortable beds. This is where we stay tonight. 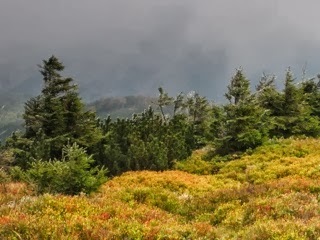 People hike Šerák Mountain to enjoy views. We are not granted any, the weather is getting progressively worse and by 17:00 the clouds around the cottage are so thick we can hardly see more than 15 away. So instead of views we enjoy glass of mulled wine, best we tasted along the route, hoping the weather will clear during the night.